I was diagnosed with breast cancer in March 2014 and am currently in treatment. 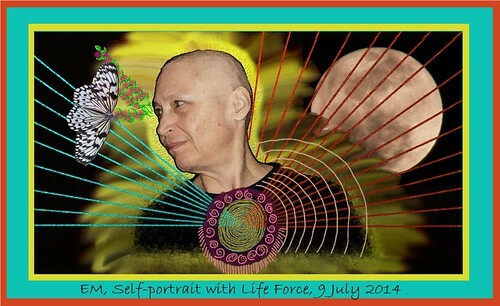 I blog about my progress here and participate in #bcsm (breast cancer social media) and at WhatNext.com. 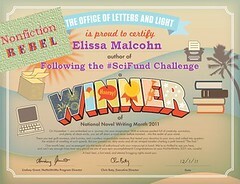 I was a first-time participant in National Novel Writing Month in 2011 -- as a nonfiction "rebel." I've blogged about my project here. 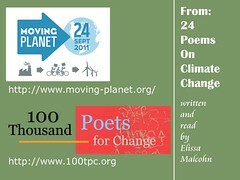 On Saturday, September 24, 2011, I joined Moving Planet and 100 Thousand Poets for Change simultaneously, by posting 24 climate change-related sonnets in 24 hours, midnight to midnight Eastern time. My index contains live links to each poem, along with the news article(s) that inspired it. Download Deviations here (alternate site). Multiple formats available. And if you like what you read, please spread the word! 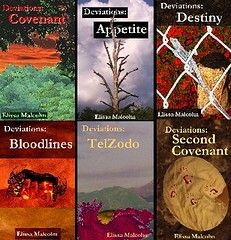 "This is a dark series with a hidden deeper meaning. Malcohn's books are a look at the world we live in. This is not an easy read but it is an important read." Work appears in Comedy, Forgiveness, and Gifts in the Caregiving.com CareGifters Series. (I also provided the cover images for Forgiveness and Gifts.) The series helps raise funds for the site's CareGifters Program, which awards small grants to caregivers in need. My work also appeared in the 2012 Caregiving Art Show, which also benefited the CareGifters Program. I recommend Caregiving.com if you are or know a caregiver. The site provides wise and nurturing online support with free membership and activities (blogs, forums, groups, podcasts, webinars, chats, and more), along with some subscription services. Caregiving.com also facilitates a biweekly #carechat on Twitter. 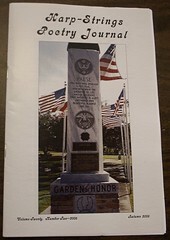 My poem "Last Rites" appears in Fifth Di... 14(3). A glosa cycle of 300+ lines, it is the longest poem I've written to date. "The Last Dragon Slayer" appears in The 2012 Rhysling Anthology (long poem category) of nominees for the 2012 Rhysling Award. "Attack of the Giant Spiders" appears in Eye to the Telescope #5: LGBTQ Speculative Poetry. My Etheree "When Zombies Go Steady" and Vietnamese Luc Bat "The Bot�s Dilemma, Upon the Death of Earth" appear in Eye to the Telescope #4: Speculative Poetry in Form. "Partial Solar Eclipse" and "Grand Raiment" appear in Exploring the Cosmos: minimalist science poetry (.pdf). 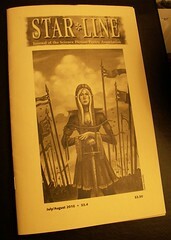 Star*Line, 34(4), Oct.-Dec. 2011. 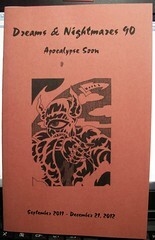 In addition to my report on the poetry program at Necronomicon, this issue contains my guest-edited Interplay section. Table of contents (and links to my two Editor's Picks) here; blog entry on my editorial process here. Review of Ted Cascio, PhD, and Leonard Martin, PhD, eds., House and Psychology: Humanity is Overrated, Psych Central, December 2011. My poem "Shrine to the Disconnected" appears in Dreams and Nightmares #90 ("Apocalypse Soon"). Review of Loren A. Olson, M.D., Finally Out: Letting Go of Living Straight, Psych Central, August 2011.
Review of Clark McCauley, Ph.D. & Sophia Moskalenko, Ph.D., Friction: How Radicalization Happens to Them and Us, Psych Central, August 2011. 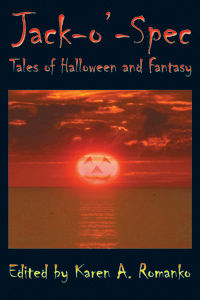 My story "Visitations" appears in Jack-o'-Spec: Tales of Halloween and Fantasy (Raven Electrick Ink). 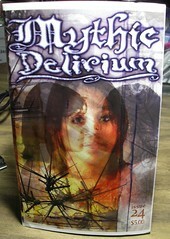 My poem "The Last Dragon Slayer" appears in Mythic Delirium #24. "'[A] venture into lightheartedness' is what editor Mike Allen calls this latest issue of Mythic Delirium. The poetry assembled here certainly makes for an excellent adventure, and lightheartedness often plays a part, but even so, all these lyrical quests have a weighty center. 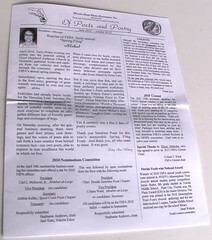 My article "Social Networking and the Found Poem" appears in WyoPoets' Newsletter, April 2011 (reprint). Click here for the .pdf file. 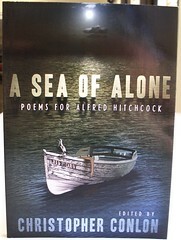 My poem "Far From the Pleasure Garden" appears in A Sea of Alone: Poems for Alfred Hitchcock (Dark Scribe Press). Order here. My sonnets "In Development" and "Manipulations" appear in The Open Laboratory 2010: The Best of Science Writing on the Web. Click here for links to the original blog posts. Order the book here. 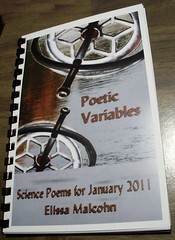 In January 2011 I posted a science poem a day, written in various traditional forms, in honor of Science Online 2011. Click here for an index with live links to the poems, the science articles that inspired them, and descriptions of the different poetic forms used. E-mail me for more information and to order. From the back cover blurb: "Thirty-one poems celebrate both scientific variety and the many forms of verse. From mental time travel to a 14-million-year-old lake. From jet-lagged mold to frugal amoebas. From quantum states in migrating robins to salmon finding their way by smell. And much more, in forms ranging from Abecedarian to Villanelle, Persian Ghazal to Korean Sijo and beyond." Several poems from this collection have been submitted to Open Laboratory 2011. Click here to see the original cover photos. Want more science poems? Check out 30 Science Sonnets for April 2010.
Review of Kathryn Hansen, Brain Over Binge, Psych Central, February 2011.
Review of Simon LeVay, Gay, Straight, and the Reason Why: The Science of Sexual Orientation, Psych Central, February 2011. 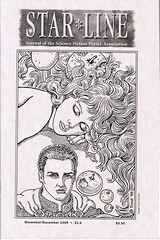 "Ciliate Sestina" and "Duet Singularity" appear in a special science poetry section of Star*Line, journal of the Science Fiction Poetry Association. "Ciliate Sestina" was named Editor's Choice and appears here. "Review of Kate Anthony et al., The Use of Technology in Mental Health: Applications, Ethics and Practice," Psych Central, November 2010. 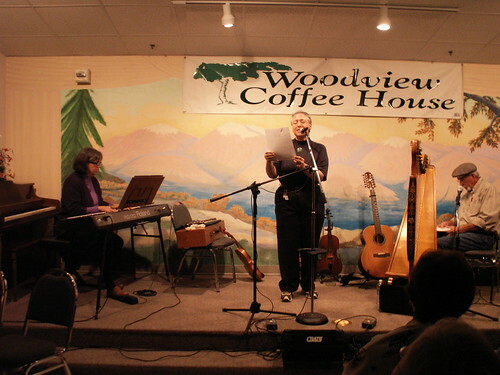 My song "This Is Our Gulf" won first prize in the Woodview Coffee House song-writing contest. More info and links to recordings are on my blog. Inspired by the Gulf oil disaster and in the tradition of Woody Guthrie's Dust Bowl ballads, the contest sought "to document in song the threat this oil disaster poses to our Gulf Coast way of life; to celebrate the beauty that is threatened by this manmade disaster; and to encourage alternate means of producing energy which are safer, cleaner and renewable." 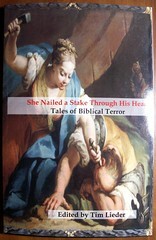 My story "Judgment at Naioth" appears in She Nailed a Stake Through His Head: Tales of Biblical Terror (Dybbuk Press, October 2010) -- available here. "Review of Karyl McBride, Ph.D., Will I Ever Be Good Enough? Healing the Daughters of Narcissistic Mothers", Psych Central, September 2010. 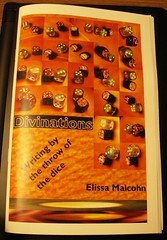 Divinations: Writing by the throw of the dice is an outgrowth of writing I did as part of Folded Word's "24/7" event. I posted the original drafts on my blog (index here) and compiled them into this chapbook (e-mail me to order). I've made some revisions to the original works, changed their presentation order, and changed or omitted a few of the blog's thematic photos. From the back cover blurb: "Twenty-four short works, their structures determined by dice-rolls, explore the theme of 'divination' through natural, supernatural, and speculative means. A centurion dreams of the future; a time-traveler loses himself in the past. Warriors face an ill-omened army made of wax. A princess fulfills an unsettling prophecy; a young girl creates her own. New Year's Eve heightens a family dog's awareness. Bionic lightning strikes a pastor from within." Star*Line 33(4) (July/August 2010) includes my poem "Evolutionary Variants on a Russian Proverb," Edward Cox's review of my collection 30 Science Sonnets for April 2010,and my write-up of the speculative poetry workshop I gave at Ancient City Con IV. Micro-fiction "Heisenberg's Metamorphosis," "Bittersweet," and "Fierce Harvest" appear in the Sept. 6, 2010 ("Labor Day Special") PicFic. "Ballerina" by Paul Vincenti. Image used with permission. Thanks to artist Paul Vincenti, who posted my poem "A Meeting of the Arts" to go with his painting "Ballerina." Paul painted this portrait live, on the spot, in 90 minutes (with subsequent fine-tuning), before a crowd at a gallery opening. I then challenged myself to write a sonnet about the painting, on the spot (though not before a crowd). I drafted the poem in about a half hour and e-mailed it to Paul. 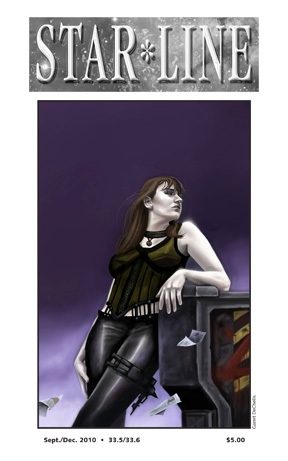 Click here for his online gallery and here for his fantasy art gallery. "Far From Free Association" appears in the open-mic section of Poets for Living Waters, a poetry action in response to the BP oil disaster in the Gulf of Mexico, here. "Downrange: Elissa Malcohn" (interview) appears in the inaugural issue of Valent Range, Summer 2010. 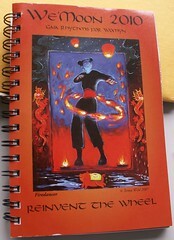 "Pele's Wandering Fire" appears in the June 2010 Of Poets And Poetry (Florida State Poets Association). The poem received second prize in the FSPA's Spring Fling contest (theme: Hawaiian culture), free verse category. My story "Icarus Redux" appears in the June 2010 issue of Niteblade. Direct story link here. 30 Science Sonnets for April 2010: For National Poetry Month (April), I wrote a sonnet a day based on a science-themed news story. The sonnets and links to the articles that inspired them are posted on my blog (index here). 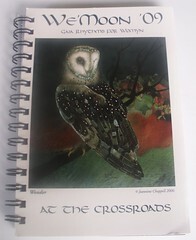 I've also put the poems into this chapbook (e-mail me to order). "The wide range of subject and information covered by the author form a big bag of ideas that are just waiting for some dreamer to extrapolate into tales of fantasy and wonder -- and, who knows, maybe someone will. 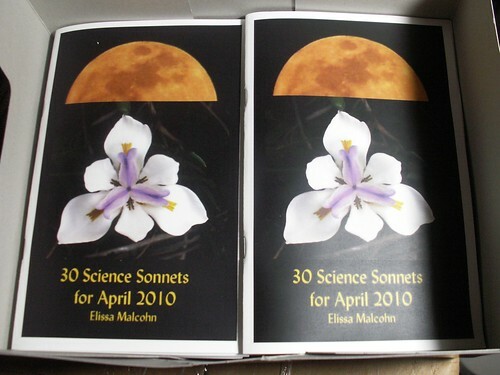 But for the time being, while we're dealing with the truth, 30 Science Sonnets for April 2010 is an entertaining and thoughtful read, and one very strong reason why Twitter is a good thing." -- Edward Cox, Star*Line 33(4). From the back cover blurb: "Thirty sonnets delve into science's breaking news during a month of discovery. From advances in cloaking devices to dogs helping war veterans through post-traumatic stress disorder. From an asteroid passing close to the Earth to one containing basic components for life. From bees whose genes dictate their diets to beavers recruited to help a state cope with climate change. And much more." The cover features an African iris (original shot here) and a photo I took of the Moon, reddened from Georgia wildfires (original shot here). Two sonnets, "In Development" and "Manipulations," have made it into Open Laboratory 2010. Click on the badge below for links to the 50 essays, 6 poems, and 1 cartoon in the collection. 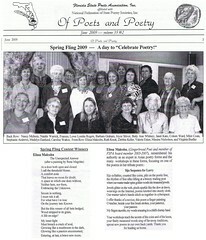 My poem "Butterfly Woman" appears in the Winter 2010 issue of Goblin Fruit. Click here for the text, here for my audio. Micro-fiction appears in Thaumatrope, here. Poem "Nor'easter Requiem" appears in unFold, here. Poem "Total Lunar Eclipse" appears in the Spring 2010 Astropoetica, here. Poetry appeared in microcosms on May 17, August 12, and November 22, 2010. Micro-fiction "Empty Nest" appears in the May 18, 2010 PicFic, here. Also, my photo of manatees appears as the prompt for Pic of the Week #10, here. My poem "Derivative Work" and novelette "Flotsam" appear in the October/November 2009 issue of Asimov's. "Flotsam" is on the recommended reading list in The Year's Best Science Fiction, 27th Annual Collection, and on the Tangent Online 2009 Recommended Reading List. "As a young girl Mercedes discovered a biological 'impossibility' in the polluted coastal waters of her city. The discovery, and the way it was denied haunts her throughout her life in the working class world of the US-Mexican border. Working blue collar jobs, she spends her free time researching the impossibility she's sure she remembers from childhood. An excellent story, which does particularly well at blending the story of Mercedes as a person between cultures into an sf story." -- Matt Bruensteiner, Garbled Signals, commenting on "Flotsam." My poem "Lepidoptera from Space" appears in the November/December issue of Star*Line, journal of the Science Fiction Poetry Association. This is a special prose poem issue. My poem "The Unexpected Answer" appears in the Autumn issue of Harp-Strings Poetry Journal, reprinted from Of Poets And Poetry. My poem "Neighbors" appears in the anthology Vampyr Verse, from Popcorn Press. Order here. 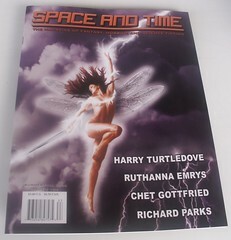 "Where Relativity Ends" appears in the February 2, 2009, issue of Strange Horizons. Click here for a direct link to the poem. My photo of a mole cricket appears in the article, "What to do and what not to do in your garden in February," now archived at the website Gardening in South Africa. Original shot here. 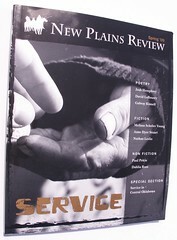 Creative nonfiction appears in the "Short Takes" section of New Plains Review's "Service" issue, Spring 2009. The essay is a modified version of this blog entry's closing (May 6, 1990) portion. My poem "Frightening the Horses" appears in June 2009 (8th anniversary) issue of Aoife's Kiss, from Sam's Dot Publishing. Order here. 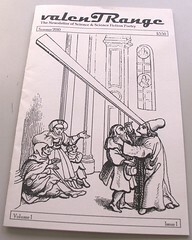 My poems "The Unexpected Answer (after a painting by Rene Magritte)" and "Sijo Sequence for Larry" appear in issue 35(2) of Of Poets And Poetry, newsletter of the Florida State Poets Association, June 2009. "The Unexpected Answer" won the FSPA's mini-contest at its "Spring Fling" meeting. "Sijo Sequence for Larry" is a tribute to Larry Gross, who was honored at the event. I'm in the lower left-hand corner of the group shot shown here (taken using tripod and auto-release), and also served as photographer for the meeting. 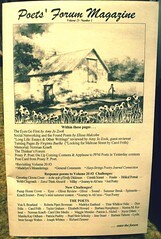 My photo "Morning Ferns" appears in We'Moon 2010, as the border on pp. 72-3. Original shot here. 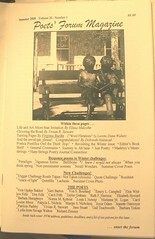 My article "Social Networking and the Found Poem" appears in Poets' Forum Magazine issue 21(1), Summer 2009. If you're connected to me through Facebook, you can read the poem here. EV is the 2009 Hugo Award Winner for Best Fanzine! -- see here for details. "Hermit Crabs" is on the recommended reading list in The Year's Best Science Fiction, 26th Annual Edition and heads the line-up in Electric Velocipede #14, released at WisCon in May 2008. Click here to order. 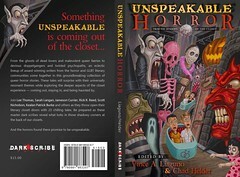 Bram Stoker Award Winner for Superior Achievement in an Anthology! -- see here for details. 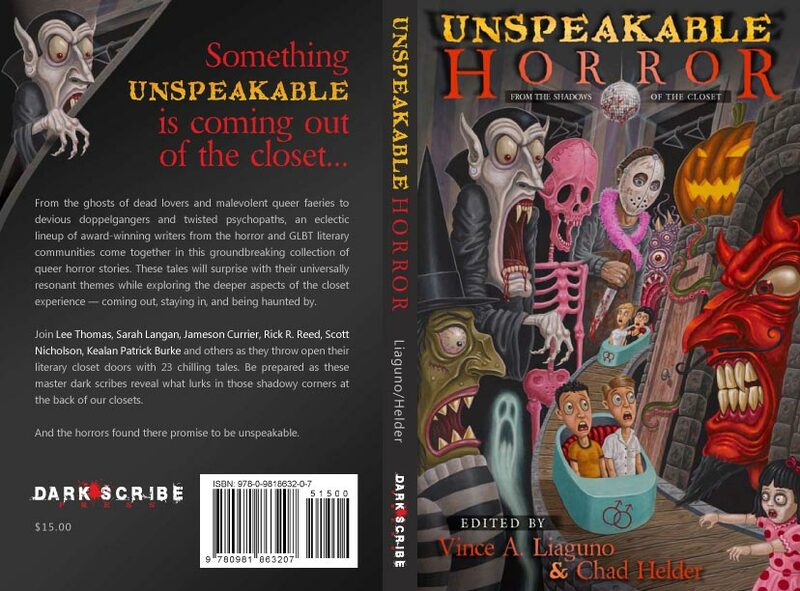 Unspeakable Horror: From the Shadows of the Closet (Dark Scribe Press, ISBN 978-0-9818632-0-7) includes my story "Memento Mori." Available here. Click here for author interviews, here for more about the anthology, and check out the book trailer at the bottom of this page. IPPY Awards 2009 Silver Medalist! -- see here for details. 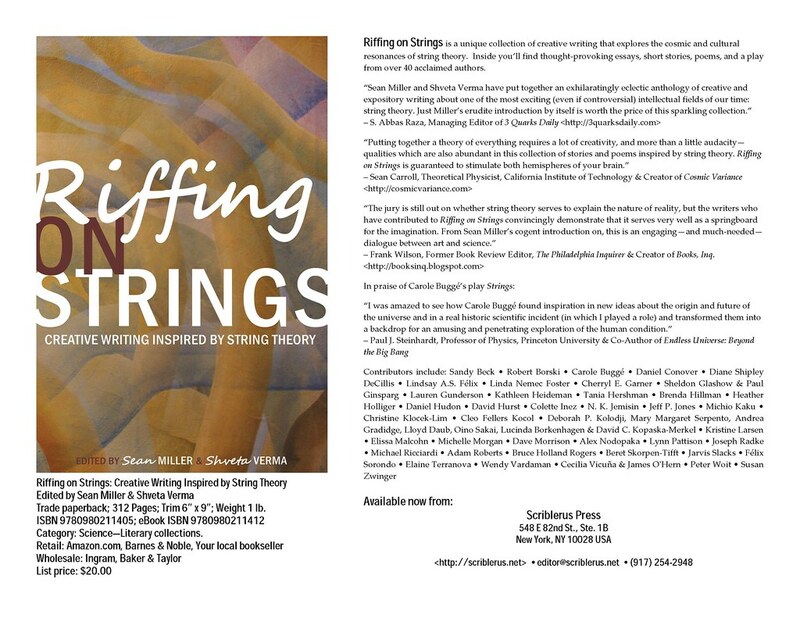 "Arachne" appears in Riffing on Strings: Creative Writing Inspired by String Theory (ISBN: 978-0-9802114-0-5), released June 1 from Scriblerus Press. Click here for ordering info and here for contributor bios. 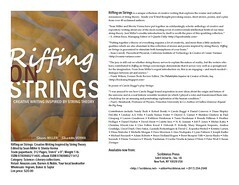 Riffing on Strings was well-received at New Scientist -- read an excerpt of their review here. 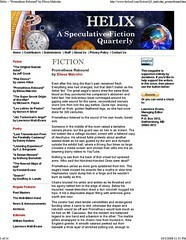 "Prometheus Rebound" appeared in Helix: A Speculative Fiction Quarterly #10. The Helix site came down at the end of 2008. A .pdf file of the story remains up for viewing here. My poem "Algebraic Sestina for the Ocean" accompanies Anna Lovric's article, "What is the connection between poetry and maths?" 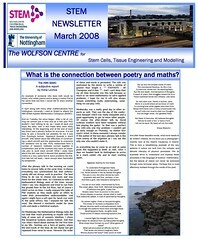 in the March 2008 issue of STEM Newsletter (Wolfson Centre for Stem Cells, Tissue Engineering and Modelling at U. Nottingham, UK). 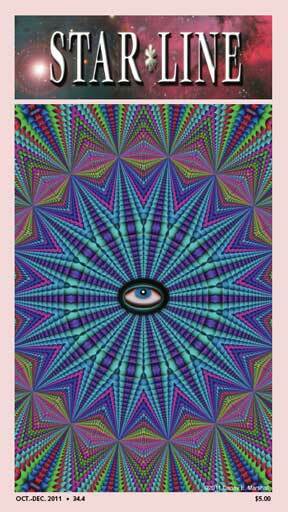 My poem "Ancient Wisdom Distilled" appears in We'Moon '09, available for order here. 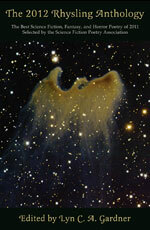 My poem "First Contact in Appalachia" appears in Space and Time #104, available for order here. "The Light of Barbara Mabrity (1782-1867)" appears in the Autumn 2008 issue of Harp-Strings Poetry Journal. The work won second prize in the Florida State Poets Association's "Cracker Award," given to a poem written about a historical person or event in Florida. "Identity Theft" appears in The Drabbler #10; "Houston, We Are the Problem" appears in The Drabbler #11; and "FTLM (Faster-Than-Light Messenger) Transcript" appears in The Drabbler #12, available for order here from Sam's Dot Publishing. Photo in Environment News Service, "Bush Administration Covered Up 500+ Blocked Water Pollution Cases," December 16, 2008. Original shot here. Interview with Ms. Z at The Genius Salon, Nov. 26, 2012. Interview with Trisha Wooldridge at A Novel Friend. Andromeda Library with hosts Tony and Glenda Finkelstein; originally aired in April 2009: podcast and link/photo-inclusive transcript. Chronicles, with host Mark Eller, May 28, 2009: podcast and transcript. Conversations LIVE! (sponsored by The Write Stuff Literacy Campaign) with host Cyrus A. Webb, July 6, 2009: podcast and transcript. Conversations LIVE!, "The Business of Books: Fantasy" with author panelists Brian Rathbone, Arlene Radasky, Mark Eller, Rhonda Carpenter, and host Cyrus A. Webb, October 22, 2009: podcast and transcript. Conversations LIVE!, March 3, 2010: podcast and transcript. You can hear me read an excerpt from Deviations: Appetite on the Broad Universe Broad Pod, Episode #2. I start at around the 16:23 mark, here. Participant, "Post A Story For Haiti." See Crossed Genres for links to more free fiction, along with organizations aiding in relief efforts. I created this Web site with the invaluable help of HTML 4 For Dummies, by Ed Tittel and Stephen Nelson James (IDG Books Worldwide, Inc., 1998), www.dummies.com.